Antique Japanese tall banner for Boy's Day celebration, two mon (family crests), scene depicting a noted scene from a noh play called Takasago. The two old couples represent the wish for a couple to be together till the end. The rake represents raking in fortune and the broom for sweeping away misfortune and bad energy. A crane above and an ancient turtle below, both also symbolic of longevity. The banner is painted in mineral pigments on cotton. 190" high x 26 1/2" wide. 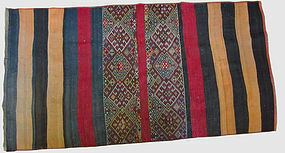 Hand knotted yoruk rug with two bands of decoration bordered by rust and black bands. c1920. It measures 104 cm by 85 cm. 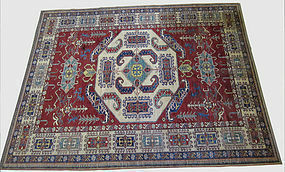 Hand knoted persian rug made of wool. Dark blue against a pale rose ground makes this an eye catching piece. The central medallion is bordered with a pale green. The border has floral scrolling band between bands with parallelograms in blue, green, and rose pink. Staines and wear in central area. 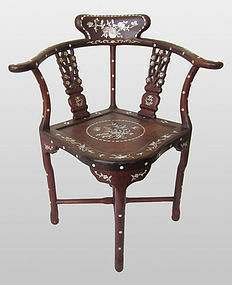 It measures 7'7" by 5'7"
Fine Chinese antique hardwood corner chair, inlaid with mother of pearl with designs of flowers and flower baskets with birds and dragons. Beautifully carved, curved arms. Age: Republic Period (c1910). Size: 27.5"w x 33.5"h x 17.78" seat height. 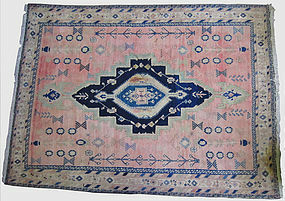 Hand knotted kashkaie rug made of wool. It has a beautiful design of bands with large medallions interspersed with bands of small rectalinear medallions (c1950) It measures 6'2" by 8'7". 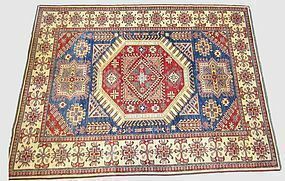 Kazak style hand knotted wool rug with central red hexagonal medallion on a blue ground with a cream colored border C.1925. Vibrant original colors. Great for everyday use. Size: measures 7'1"" by 8'7". 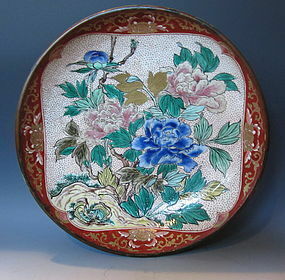 A set of 7 fluted plates decorated with various plants symbolic to Japanese culture and motifs often seen in Japanese porcelains known as Imari ware. 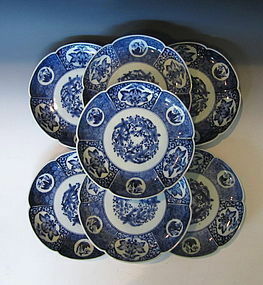 The plates contain an inscription, kigyoukuhoutei no chin, that often is associated with a specific type of Imari ware known as Daiseiji Imari ware. The motifs, designs, and at times the inscriptions take inspiration from Chinese Qing dynasty porcelain wares. Age: 19th century. 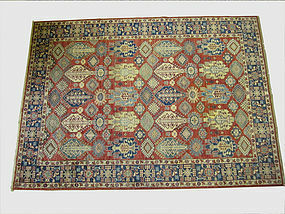 Size: height 1.25" diameter 8"
Kazak hand knotted rug made of wool from the middle east. Beautiful central medallion with blue, red and green design on a pale yellow/cream colored ground. The border has unusual medallion shaped design in red with blue, blue with yellow, and light pink with green. It measures 8' by 10'8".